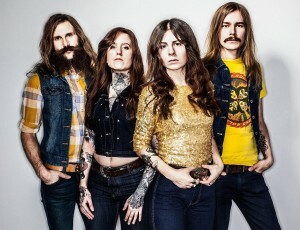 After their heavy hitting debut single “Fast Love” (2014), the weighted question remains as to whether HONEYMOON DISEASE can deliver the same quality on a full-length debut. And the answer is YES! The Transcendence is an album full of future classics steeped in timeless charm, blessed with massive grooves, spirited with cocky howls, and seasoned with classic style riffs. These Swedish Groove rockers are ready to release their album The Transcendence on November 20th via Napalm Records! Today they release a brand new lyric-video for the track “Gotta Move” HERE! To get the full live experience check out their upcoming tour dates together with mighty AVATARIUM and THE VINTAGE CARAVAN!